Another party, another controversy, this time at the Game Developer Conference. You can be sure if there’s an article denouncing a party or event of some sort, it usually involves women. The IGDA has come under fire after news broke out that their GDC party last night had a group of scantily clad women dancing for the patrons of the party. As a result, many developers have pulled their support from the organization and some have even stepped down as board members. Here we have the two usual camps to the controversy: those who are outraged and those who are confused by said outrage. If we’re to set aside the percentage of the confused herd that are saying we’re too sensitive (you know who they are), we’re left with those that are honestly perplexed by the entire situation. As an industry, we sometimes forget that there are people that see nothing wrong with this type of entertainment and that it has nothing to do with sexism. They’re those who are not offended, in fact comfortable, with hired entertainers of this nature dancing at a party. And what I fear is that these people are then chastised for not being as outraged as everyone else, which is not helpful and further segregates us from our peers. If we’re to look at the pictures and tweets of the event, it seemed more like an EDM concert or a club scene. There were neon lights, dubstep and rap music blaring, dancing (both by female dancers and the patrons), etc. The type of entertainment suited the venue and the atmosphere the party was trying to emulate. 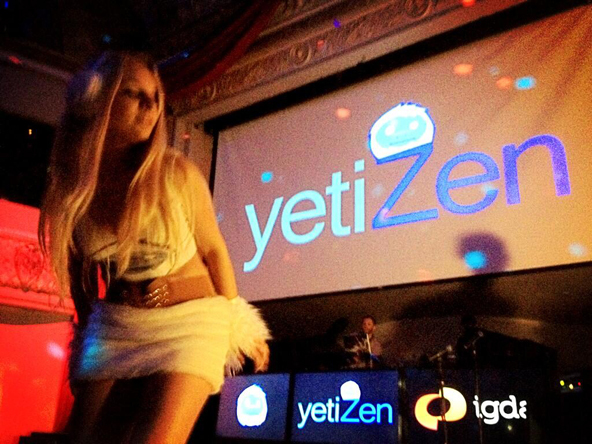 Although it turns out it was YetiZen who orchestrated most of the event—we’re familiar with their past work—it was still in partnership with the IGDA, the International Game Developers Association. An organization that prides itself in bringing professional intellectuals together, yet somehow there was a lack of professionalism in the execution of this party. Not only were the promotional fliers handed out by ‘booth babes’ earlier in the day, IGDA members had trouble even getting into the party. Then when inside they were greeted with these dancers that we now know offended some attendees and IGDA affiliates. This relates to another matter I feel the industry struggles with: you have your group that honestly just wants to talk with like-minded individuals while drinking some beer (and what better way than at company-hosted events that gives everyone a common place to meet), and you have the other group that some say are trying to “Hollywood-up” the industry. In other words, have the lavish crazy club-inspired parties celebrities of other mediums get to enjoy on a regular basis. I only use this assumption because it’s the only way I can think to describe it. It’s when you try to mix these two groups of people together that you end up pleasing one side while offending the other. That’s when it’s not okay. That’s when you have to be mindful of everyone’s feelings, and see if “going all out” is worth it. Evaluate if you’re really the company to pull something like that off. After all, while the IGDA party had go-go dancers in furry skirts, my Twitter stream had pictures of other parties where women had much more revealing outfits. Yet these parties aren’t making any headlines. There’s the Wargaming party (images above) that featured women in leather and gas masks, the Nvidia party with belly dancers, Storm8’s assortment of leotarded women, and a Unity3D event with acrobatic dancers. Why are these not causing outrage on Forbes? Because of the type of company associated with the event and the type of the entertainment. Acrobatics, women balancing swords, and belly dancers are all quality entertainment that focus on the skills of the performers vs. their looks (but I’m sure it doesn’t hurt). As for Wargaming, it’s a developer that isn’t about the “quality of life, perpetuation of our craft and preparing the next generation of developers” like the IGDA claims. It’s a company who wanted to throw a party and knew having women dressed as sailors would bring people in, so they’ll attend and maybe try out their games later since they had such an amazing time… or something, I don’t know. That’s its own issue. The IGDA party scandal boils up when you think of the timing. The #1reasonwhy is still fresh on our minds, especially for GDC attendees who listened to the panel in relation to the hashtag, which Brenda Romero took part in. This comes one day after the new IGDA Executive Director Kate Edwards makes a statement how the IGDA will work harder on issues plaguing our industry, one of which is women in games. Meagan Marie just shed some light on an occurrence at PAX that finally broke her silence on sexism in the industry. These stories won’t go away unless we continue to speak up on these matters, because there’s a legitimate reason people feel insulted. For those who believe nowadays women are just finding new ordeals to complain about for the sake of complaining, that’s unfortunately a narrow-minded view of the situation. Women are becoming more vocal because they were silent before; they were afraid of the same backlash they’re now experiencing because they spoke up (see Meagan Marie’s update, how Anita Sarkeesian’s been treated, etc.). They want change, but it comes at a cost. Having industry parties with women in low cuts or bikinis to appease men is alienating, especially when they’re hosted by non-profit associations that state they’re about equal representation of all developers. That said, these women don’t want to seem like they’re trying to ruin everyone’s fun or stir the pot when there’s nothing in the dish. After several expos, I can attest that developers want to relax just as much as you; parties and friends are the best part of the conventions! Finding themselves quoted on Joystiq for the latest dispute is not on the top of their ‘to do’ list. But there also has to be a bit of a compromise… wait, hear me out! We have to understand there are individuals who see nothing wrong with this type of entertainment, the same way we have to understand that there will be individuals who get offended by the exact same thing. Those men and women who are not offended also have to acknowledge that there is a time and a place for such matters, and it’s all about catering to the right audience (while still not overdoing it). We have to remember that just because someone is not offended it doesn’t make them sexist, at least not in this IGDA situation. We shouldn’t demean someone’s character; we have to be mindful and willing to listen to other viewpoints, because it’s not always so black and white (just look at Holly’s contempt to the Tomb Raider controversy). We also have to respect that those women were paid entertainers, who consented to do what they did, and they shouldn’t be poorly spoken about. It’s all about understanding folks!